An annual tradition since its second season, Slices presents an entertaining evening of eight original one-act plays chosen from submissions (over 20 this year) by members of the Pear Playwrights Guild. Pear Slices 2011 adds a new dimension with each play depicting the “American experience” in some fashion and marks the 60th Pear Avenue Theatre production. Two directors, Diane Tasca (also the costume designer) and Troy Johnson (also the set designer), each taking four plays, along with actors Robert Campbell, Leticia Duarte, Wendy Tremont King, Maria Giere Marquis, Jeff Newton, and Todd Wright, each playing multiple roles throughout the evening, take us on our journey. Wright and Marquis are the two standouts, easily transforming into disparate roles from various time periods, each requiring mood and delivery changes. Wright further defines his characters using convincing dialect changes along the way. The eight plays: 19 by V.B. Leghorn, Lost Girls by Earl T. Roske, The Last Arawak by Ross Peter Nelson, Through Delhi by Leah Halper, Motherhood by Elyce Melmon, Imperfect Union by Ross Peter Nelson, Letter from Leipzig by Margy Kahn, and Showdown by Beverly Altschuler, range from factual to fictional, historical to contemporary, and humorous to serious. Johnson’s set consists of two platforms, essentially bisecting the stage, with a small center gap for entrances and exits. Play-specific projections on the house right platform back provide introductory titles and differing scenes for each of the plays. 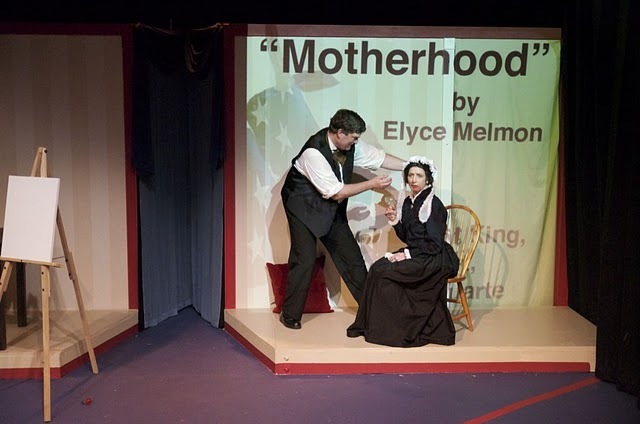 Prop additions including tables, chairs, an easel in Motherhood, crates, and even crime scene tape in Showdown help bring the audience into the appropriate frame of mind. Sound designers Gordon and Jeanie Smith add a nice touch using thematic music appropriate to the next play to cover the scene changes, although the plays themselves are completely unrelated outside of the season’s broad “Americana” theme. Additionally, their sound effects fill out the theatrical illusion providing crowd sounds in 19, an echo leading into the dream sequence in The Last Arawak, and so on. In 19, Tennessee State Congressman Harry T. Burn (Campbell) and his wife (Marquis) discuss women’s suffrage in an unexpected way. Set in the 1920s, but with mostly contemporary language, much of Campbell’s dialog feels somewhat affected and forced. In contrast, Marquis’s delivery is very relaxed and appears effortless. They have good stage chemistry though, and we can believe they are a married couple on opposite sides of what would be a threateningly heated suffrage discussion, were it not for nicely timed bits of humor to lighten the mood. Both clothed in bathrobes, Campbell’s street clothes underneath are a bit too conspicuous, his shirt and tie obvious, but are necessary to facilitate a quick costume change toward the end of the play. Dorothy (King) and Suzanne (Duarte) in Lost Girls are two former pregnant teens twenty years hence, the last of the group maintaining contact through a monthly meeting. The dialog is realistic, serious, and heavy. King is harsh and bitter, and her delivery a bit stiff. 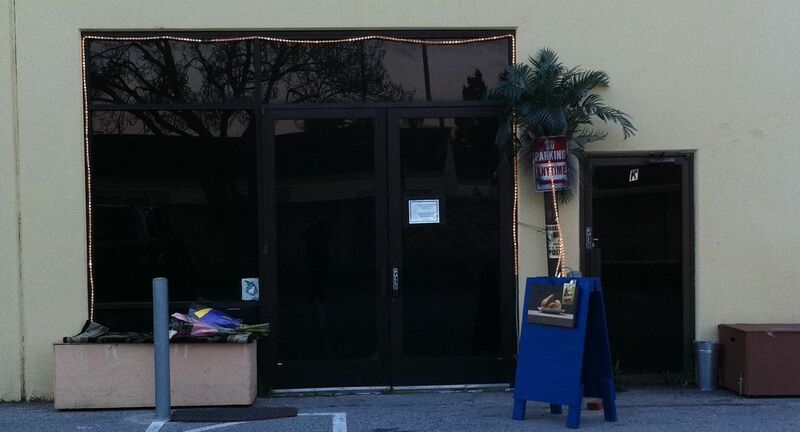 Duarte is more approachable, open to the changes in the “current” time, current being the 1970s. The Last Arawak begins in a serious “real-life” vein with Brother Diego (Wright), Bishop Bartolome de Las Casas (Newton), and Lucaya (King) discussing the current state of colonization and conversion, though the dialog in this section is cumbersome and drags. Then, injured, Newton loses consciousness, and falls into a dream. Following a transformation, with appropriate costume changes, Columbus (Wright), and the Pope (King) are very funny, picking up the pace with rapid-fire dialog laced with anachronistic humor as they help Newton sort out the right course of action. The reverse transformation has a particularly nice bit of staging and costuming, with Wright reversing his cape with a flourish to again become Diego, and King changing back to Lucaya on stage. 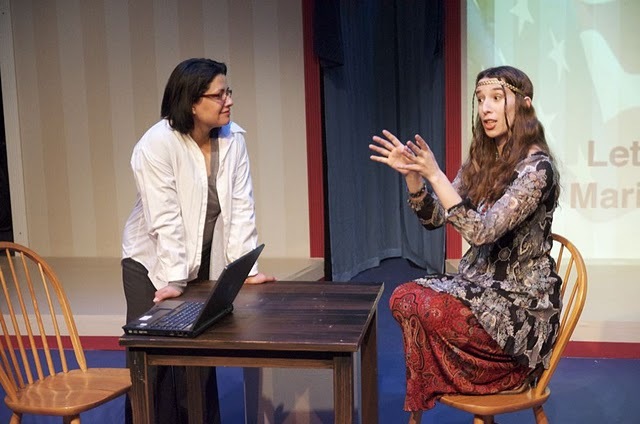 In Through Delhi, Gale (Duarte) has employed technology to create an avatar of Blossom (Marquis), her mother, an aging hippie dying of a progressive fatal illness, to allow a final negotiation to resolve outstanding questions about their lives together. Well-written, a serious discussion between mother and daughter ensues as Duarte tries to come to terms with her mother’s life choices. Nicely timed humor punctuates the discussion clarifying Blossom’s position, to save the children of the world, or at least in India. Marquis clearly has fun swooping about in colorful “hippie” garb, Duarte playing the perfect foil for Marquis’ sometimes manic exposition. In Motherhood, Whistler (Wright), and Whistler’s mother (King), banter about the stage, Wright looking for the perfect subject for his painting, all things being mere props, if they only have the proper light. As Wright attempts to place King in the right position, her facial contortions are rather amusing. The rapid fire dialog hovers between period and contemporary language. King’s dialog delivery is a bit stilted, but fits her character, nicely contrasting with Wright’s more eccentric Whistler persona. Duarte has a cameo as Joanna Hifferman, the model Whistler fired, and the quick altercation between her and King works well. 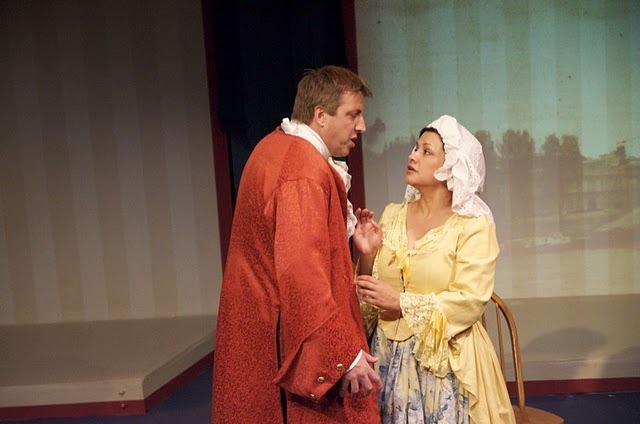 In Imperfect Union, Thomas Jefferson (Newton) and Sally Hemmings (Duarte) spar about their “relationship”, trying to keep Polly Jefferson (Marquis) out of earshot. Marquis is believable as the dutiful daughter negotiating with her father, but Newton’s and Duarte’s scene together lacks chemistry and doesn’t quite hit. The period costumes are a nice touch, and add a nice bit of color. Letter from Leipzig takes us back in history, and shows us the frontier, a different world for women. Gertrude Birge (Marquis) and Mary Birge (King) are sisters, King the elder spinster, Marquis the younger educated one. Their dialog is believable, if a bit slow. Herbert Gallinger (Campbell), a school chum of Marquis’ turns up with a grand proposition, for Marquis to accompany him to Leipzig. Campbell and Marquis have their “almost” tryst on the porch, in the cold, and are both convincing in their shivering, but while eager, Campbell’s delivery has the same over-enunciated affect as in 19, and isn’t quite believable. Showdown utilizes the entire ensemble. Ostensibly a western, the Sheriff (Campbell) enters a showdown with bank robber Bartholomew Black (Newton) that keeps getting interrupted. Campbell gives his most natural performance in this one speaking in a far more fluid manner. The play quickly devolves into Monty Python-esque absurdity, employing current technology such as computers and cell phones, and a nice bit of crime scene tape, along with anachronistic dialog from the old west mixed with current lexicon. Wright has a delightful moment as a TV producer trying to stage the events, but the sheriff’s wife (Duarte) gets the last laugh in an understated arrest. Overall, a varied and enjoyable evening’s entertainment, Pear Slices 2011 continues Thursdays – Sundays through 24 April at the Pear Avenue Theatre, 1220 Pear Avenue, Unit K, Mountain View, CA 94043-1447. See http://www.thepear.org for more information.